I offer two different incursions for schools. SHOWS and WORKSHOPS. 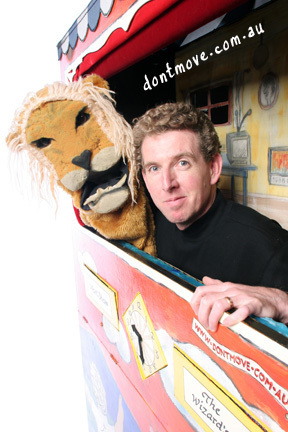 My SHOWS program includes a puppet show as described on other pages, and are also followed up with my unique ‘show and tell’ session. 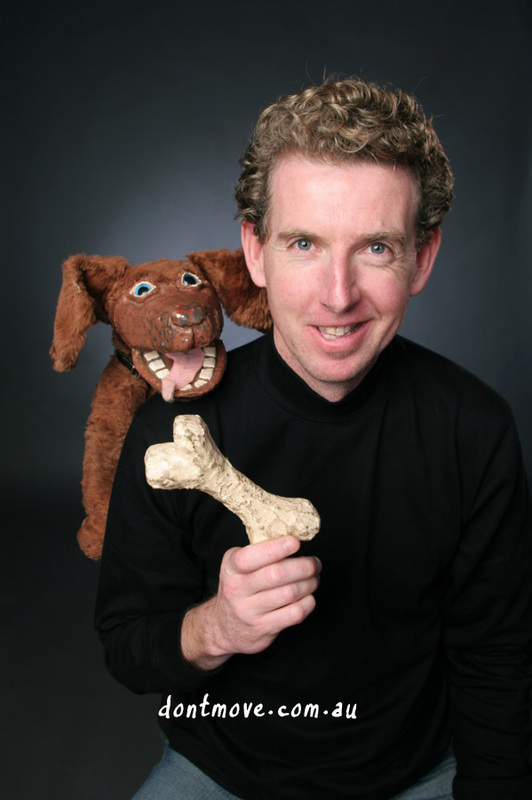 My puppet making WORKSHOPS are a separate entity or indeed can be done as a follow up to the show session. If you are after information about AusVELS and how I may fit into your curriculum, please click HERE for the appropriate information regarding your level. THE SHOW starts with a ‘Warm – up’ where I teach the students the etiquette of being an audience member. Children learn when to laugh, cheer, clap, and most importantly when to listen. I have found this process to be very successful as the younger children are often not sure how they should or can respond. The focus is then directed to our puppet booth, (complete with sound, lighting, sets and of course the famous puppet performers), and the show of your choice begins. Directly following the show I begin my tour; an explanation and demonstration of all the elements of our theatre. I show how the puppets are made, how the flag squirts water, the use of backdrops and props, sound and lighting equipment and how the entire show was created. The audience members are encouraged to ask questions. The tour gives opportunity to share some of the magic, and provides an introduction to the world of theatre. DURATION; The shows themselves last approximately forty five minutes. Together with the ‘warm-up’ and the ‘show & tell’ sections, please allow approximately ninety minutes in total. (Can be altered to suit). WHERE; Don’t Move, I come to you, anywhere throughout Victoria (or beyond on request). WHEN; I am usually available any time of the school week, however it is important to book early to secure a time that suits you. PERFORMANCE SPACE; I require a room that is big enough to seat the audience comfortably on the floor, leaving me a performance space of approximately 3 m X 3m. I also require the following : * Preferable height of three metres, (A standard room is fine). * Access to one power point. * A Wall or similar onto which to back the booth. *As few distractions as possible. MY SCHOOL SHOW PRICES FOR 2019 $5.50 per student (Not registered for GST in 2019, no GST charged) (Minimum charge: 100 students or $550. One performance generally caters for a maximum of 170 students depending on the particular space; therefore 200 students (for example) would most likely require two performances. This however does not affect the cost. 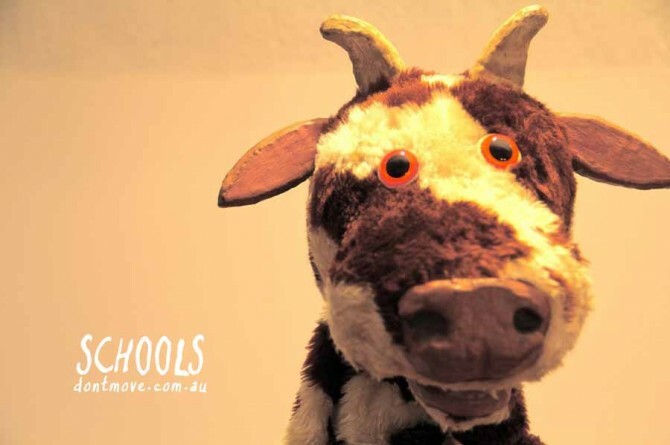 WORKSHOPS have stemmed from discussions with teachers after seeing my initial puppet shows. They involve all students making their own puppets. Students’ skills are developed as they familiarise themselves with the same craft materials as used in my own puppets. All you need supply is a sharp pair of scissors for each student, and smocks if possible. These workshops are available for all primary levels. Teachers are constantly amazed at the enthusiasm of the students, and high quality of work created. 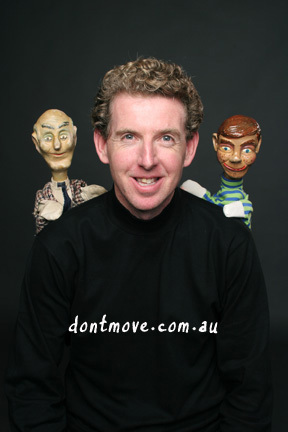 Workshops can be presented as follow-ups to our puppet shows or entirely separate. In the past parent helpers and spare teachers have been encouraged to join in the fun and assist where necessary. For a real insight into the workshops, please see my PHOTO GALLERY for examples of puppets made by students. (After each workshop I immediately upload images of nine wonderful puppet creations to this website). You can see a list of some of the materials I use in the workshops here. WORKSHOP PRICES for 2019: Just $11 per head (Not registered for GST in 2019, no GST charged)(Minimum charge: 40 students or $440) One workshop generally caters for up to a maximum of 40 students (for quality and safety reasons, depending on the particular space), therefore 90 students (for example) would most likely require three workshop sessions. This however does not affect the cost.